Charles Dixon RI (1872-1934). Watercolour with bodycolour, signed and inscribed "Victory Saluting" and dated 1911. 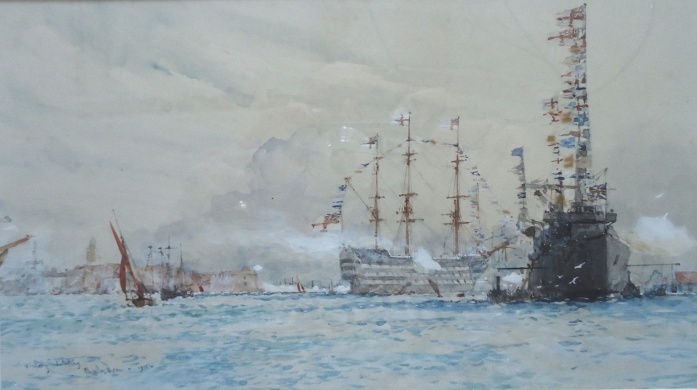 A marvellous scene and similar, of course, to Dixon's other watercolour on this website, "VICTORY Firing the Coronation salute" - similar but not, its thought, the same occasion although the weather and wind direction do appear pretty identical. But there is a striking difference and it would not be a casual artist's mistake as Dixon painted Portsmouth Naval Base a good deal and knew his onions. This watercolour shows HMS VICTORY in the berth we are used to seeing her in in the decade or so before she was moved out of the stream and into the dockyard and dry dock in 1922: down towards Haslar Creek together with another wooden waller, HMS ST VINCENT. This watercolour would clearly suggest that that's where VICTORY is on this occasion; and conspicuous Semaphore Tower is over on the left in the background, to the NE, just where it should be. The other Dixon of VICTORY on this website which is clearly inscribed in his own hand "Firing the Coronation Salute" puts her, though, in a very different position in the harbour: Semaphore Tower is now to the SE and VICTORY appears to be well up harbour and opposite North Corner Jetty which means these two watercolours do not depict the same occasion, albeit both are dated 1911 by him. This one is possibly just an occasion when the Royal Navy was giving a salute for an important occasion - the King's birthday, the arrival of a foreign naval squadron perhaps - for the other one, the one showing her much further up harbour - does have the annotation "Coronation" and together with the date Dixon has painted, 1911, must therefore be the Coronation of 24th June 1911. Perhaps this one was an earlier or later "saluting" occasion but was completed, and therefore dated, the same year, 1911.